As residents brace themselves for snow removal, Chiro One Wellness Centers offers simple tips to avoid snow shoveling back strain. 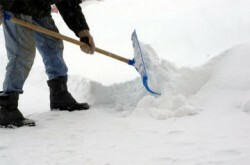 Consider the following before you grab your shovel after a major snowfall – there is a right way and a wrong way to shovel snow – paying attention to your technique can make a big difference in how you feel the next day. As with any project, the prep work is the most important. A tight, stiff body is asking for injury. A few minutes of stretching can save you a lot of pain later. When you are shoveling, don’t forget to breathe. Holding your breath makes you tight and stiff. Layered clothing will keep your muscles warm and flexible. You can shed a layer if you get too hot. Make sure you wear gloves that cover your wrists; if your wrists get cold, your fingers, hands and arms will be cold, too. Choose shoes with plenty of cushioning in the soles to absorb the impact of walking on hard, frozen ground. Use the right size shovel. Your shovel should be about chest high on you, allowing you to keep your back straight when lifting. A shovel with a short staff forces you to bend more to lift the load. A too-tall shovel makes the weight heavier at the end. (Note: Save your money – don’t buy a fancy ergonomic shovel; studies have shown that in some models, the hook end is too deep. Twisting to unload a shovelful of snow with this tool may hurt your wrists.) Also keep one hand close to the base of the shovel to balance weight and lessen the strain on your back. Drinking water frequently throughout the day helps to keep muscles and body hydrated. Be careful with hot drinks like coffee or hot chocolate. Coffee contains caffeine, which has a dehydrating effect and adds even more stress to the body. * Take your time. Working too hard, too fast is an easy way to strain muscles. Take frequent breaks. Shovel for about five minutes at a time and then rest for two minutes.